The year is 1602, and strange things are stirring in England. In the service of Queen Elizabeth, court magician Dr. Stephen Strange senses that the bizarre weather plaguing the skies above is not of natural origin. Her majesty’s premier spy, Sir Nicholas Fury, fends off an assassination attempt on the Queen by winged warriors rumored to be in service to a mad despot named Doom. News is spreading of “witchbreed” sightings — young men bearing fantastic superhuman powers and abilities. And in the center of the rising chaos is Virginia Dare, a young girl newly arrived from the New World, guarded by a towering Indian warrior. Can Fury and his allies find a connection to these unusual happenings before the whole world ends? 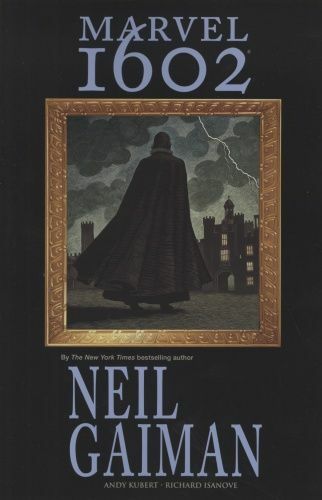 In MARVEL 1602, award-winning writer Neil Gaiman presents a unique vision of the Marvel Universe set four hundred years in the past. Classic Marvel icons such as the X-Men, Spider-Man, the Fantastic Four and Daredevil appear in this intriguing world of 17th- century science and sorcery, instantly familiar to readers, yet subtly different in this new time. MARVEL 1602 combines classic Marvel action and adventure with the historically accurate setting of Queen Elizabeth’s reign to create a unique series unlike any other published by Marvel Comics. Collecting MARVEL 1602 #1-8. Diesen Artikel haben wir am 07.12.2008 in unseren Katalog aufgenommen.